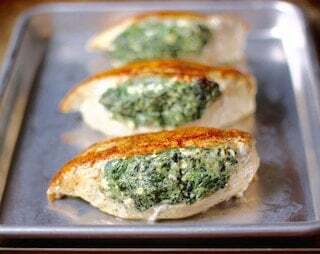 Everyone needs a few meals in their arsenal that are 2-for-1-ers, and this spinach stuffed shells recipe is one of mine. What’s a 2-for-1-er, you ask? It’s a meal that you make once, and eat twice, preferably the second time is weeks later, so it doesn’t feel like “leftovers”. Really, I make this meal once and eat it like 5 times, because even after splitting it between two dishes, I still get some lunch leftovers from it, too. The funny thing about this recipe is that I always make it with the sausage mixed into the stuffing, but this time I completely forgot to add the sausage until I’d already made the spinach stuffed shells, and you know what??? I actually liked it BETTER that way, so I decided to stick with it. Also, I tszuj it up when I’m feeling fancy with some chopped mushrooms and a cup of wine added to the sauce, but you can totally use your favorite jarred sauce and I won’t tell anyone, I promise. You can also leave the sausage out entirely and make this a vegetarian meal and it’s STILL delicious! The versatility of these spinach stuffed shells are just one more thing that makes them a staple in our house. Spinach Stuffed Shells, topped with Sausage and an abundance of decadent mozzarella cheese. Freezes beautifully. Bring a large pot of water to a boil. Cook the shells in the water for approximately half of the listed cooking time on the package ( around 6 minutes for the shells I used ). Cook the spinach according to package directions. Let cool, squeeze the water out. Mix the garlic, spinach, parsley, basil, ricotta, eggs, half of the parmesan, all of the salt and pepper in a large bowl until well combined. If you'd like to include the sausage ( SO GOOD! But usually only added as a special treat in my house ), brown it in a pan over medium high heat for 4 - 6 minutes, crumbling it up with a cooking utensil in the pan as it cooks. Prepare one 8x11 pan and one 9x9 pan ( or a second 8x11 -- I don't have two so I have to cram into my 9x9 ) by pouring the tomato sauce into the bottom of each pan. Put the filling into the freezer bag, cut 1" off of the corner to make a piping bag. Pipe each shell almost full with filling. Place each filled shell into one of the pans. Split the remaining cheeses ( mozzarella and parmesan ) between the two dishes -- covering the shells in both dishes with cheese. Bake for 25 minutes to eat tonight. Freezing directions in "Notes". I use my mushroom marinara for this recipe to make it a little extra special. I'll get the exact recipe up one of these days, but you can fake it in the meantime by adding 8 ounces of chopped then sauteed mushrooms to your favorite red sauce, plus 1 cup of red wine, and then simmer until the red wine cooks down into the sauce. TO FREEZE: Complete all directions except for the very last step ( the baking ). Instead of baking the dish, wrap it several times in foil, and then one last time with plastic wrap and place in the freezer. When you're ready to bake, remove the plastic and all but one layer of foil, and toss it in the oven at 350 F for 55 minutes, or until heated through, brown, and bubbly. Oh my gosh these look so good! I have never made stuffed shells…I know! What kind of blogger am I?! But these are sure great motivation to get going on it! They are my new obsession! I get the feeling I’ll be making all kinds of varieties in the next few months! Thanks! Such a magical combination of foods! 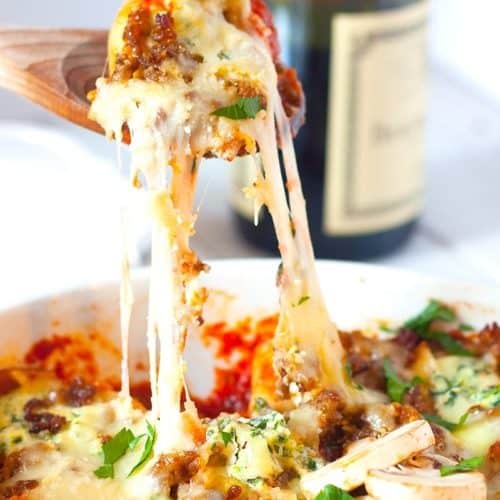 This is classic comfort food, I’ve got a recipe for stuffed shells coming up, but I can’t compete with your epic cheese pull! Haha oh man, my husband was so sick of holding that spoon while I attempted to get a good shot of that cheese! 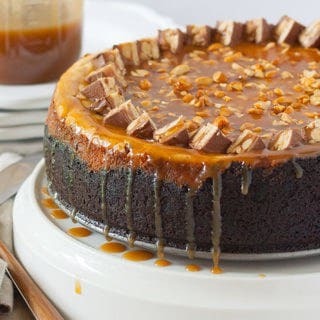 Yuuuum! I have a bag of shells in my pantry right now! These guys have been a life saver for me on more than one occasion! I can vouch that these are AMAZING. Made them last week and my husband already wants them again! Woo hoo! So glad y’all loved them! YUUM! Love me some stuffed shells, but you’ve taken these to another level! That sausage make this a hearty dinner that will satisfy everyone in the family… even my teenage boy!